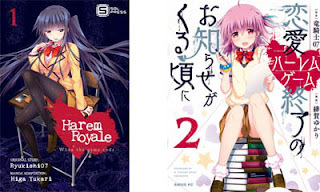 Harem Royale -When the Game Ends- Vol.1 /2+ de Ryukishi07 et Yukari Higa sortira le 7 janvier 2019. Ren'ai Harem Game Shuuryou no Oshirase ga kuru Koro ni est en cours depuis 2016 dans le Monthly Shonen Sirius des éditions Kodansha avec actuellement deux volumes de parus. Saving 80,000 Gold in Another World for my Retirement de Funa et Motoe Keisuke sortira le 4 mars 2019. Rougo ni sonaete i sekai de 8 man-mai no kinka o tamemasu est en cours depuis 2017 dans le magazine web Suiyobi no Sirius des éditions Kodansha avec actuellement 2 volumes de parus. Kouha Mitsuha falls off a cliff, at which point she finds herself transported to some sort of medieval European fantasy world! While there, during a battle with some wolves that almost costs her her life, she realizes that she has the ability to come and go between Earth and this new world. Mitsuha decides to use this ability as much as she can. Why? To save up for retirement, of course! 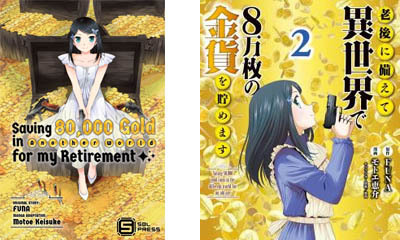 She sets her sights on saving eighty thousand gold coins--and this is the story of her schemes to get there!